This Scenario will present you the concept of Service Mesh and why we need it. What is Service Mesh and why we need it? Mixer is a platform-independent component. 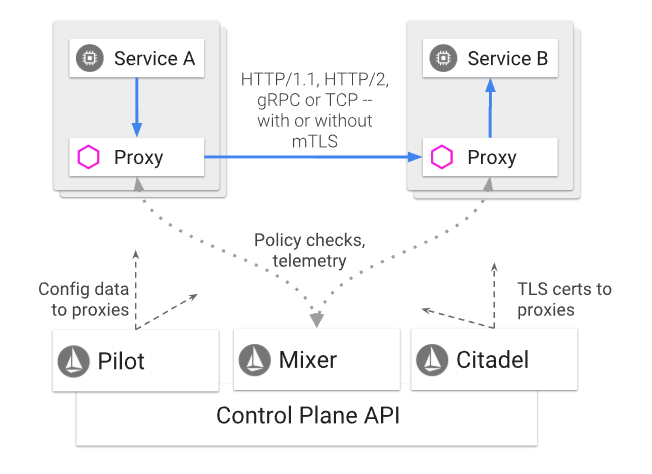 Mixer enforces access control and usage policies across the service mesh, and collects telemetry data from the Envoy proxy and other services. The proxy extracts request level attributes, and sends them to Mixer for evaluation. Citadel provides strong service-to-service and end-user authentication with built-in identity and credential management. You can use Citadel to upgrade unencrypted traffic in the service mesh. Using Citadel, operators can enforce policies based on service identity rather than on network controls. To install Istio in the cluster, we need first to make sure that we are logged in as an system:admin user. Istio uses Custom Resources like VirtualServices and DestinationRules. Istio provides a file install/kubernetes/istio-demo.yaml that contains the definition of all objects that needs to be created in the Kubernetes cluster. After the execution, Istio objects will be created. Once that they are all Running, you can hit CTRL+C. This concludes this scenario. OpenShift uses the concept of Routes to expose HTTP services outside the cluster. Now we need to add istioctl to the path. Now try it. Check the version of istioctl.